How do you help millions of rural women in one of the world’s largest countries? Find local solar cooking champions, build their capacity, and amplify their voices to be heard all around the world. Meet one of SCI's powerful Indian advocates. 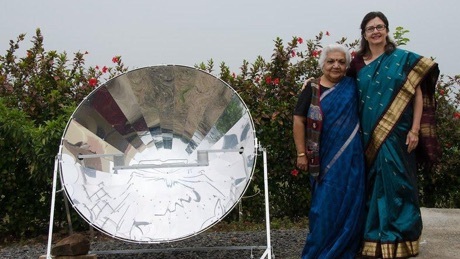 Dr. Mrs. Janak Palta McGilligan is an SCI Global Advisor, Director of the Jimmy McGilligan Centre for Sustainable Development and co-founder of Jaivik Setu, the National Coordinator for the Solar Food Processing Network India. In Indore, Madhya Pradesh, she has trained more than 40,000 students in sustainable development. In 1985, Janak Palta clearly saw the many needs of rural tribal women and girls and established Barli Development Institute for Rural Women in Indore. The Institute trained more than 6,000 tribal girls and young women from 500 villages of India in solar cooking and food processing. She also installed 500 SK 14 solar cookers in Indian villages. In her lifetime spent mentoring tribal girls, Dr. McGilligan understood the impact of good training. She helped SCI staff organize the 6th SCI World Conference 2017, where hundreds of people from around the world collaborated on solar cooking work on a grand scale. Next, SCI supporters helped share the needs of tribal girls and villagers for clean, sustainable cooking options when Dr. McGilligan joined the SCI UN advocacy team. She advocated to government leaders for environmentally friendly, clean, sustainable solutions including solar cooking. More good work followed. Next, Dr. McGilligan's innovations expanded to a solar tea stall. There are millions of tea stalls across India. Using clean, sustainable solar energy for power to make tea creates enterprise opportunities, and reduces air pollution. Dr. McGilligan is a leading example of the impact one woman can have when one believes in a cause and takes action. And SCI donors make it possible to support energetic solar cooking advocates, like Dr. McGilligan. Local leaders grow solar cooking with your help.